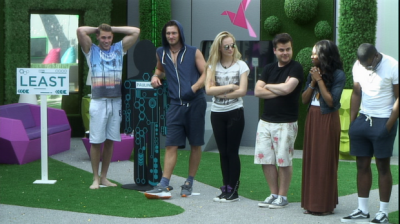 The housemates were given their first proper group task of the series yesterday. The Housemates chose CHRIS as Most FAKE and PAULINE as Least FAKE. The Housemates chose MATTHEW as Most OBNOXIOUS and PAULINE as Least OBNOXIOUS. The Housemates chose KIMBERLY as Most SUCCESSFUL and MARLON as Least SUCCESSFUL. The Housemates chose MARLON as Most ARROGANT and ASHLEIGH as Least ARROGANT. The Housemates chose DANIELLE as Most JUDGEMENTAL and WINSTON as Least JUDGEMENTAL. Not as dramatic as BB8's. Not dramatic at all. Yes I know but not from the video. In BB8's task they argued whilst doing the task, Shabnam and everyone basically, Charley and Emily, Lesley and Emily. They all seem to happily put themselves in certain spots during this task. I think both of those awards go to pauline to be honest .